How many people turn around when they watch a beautiful sunset? Not many, but here are a few good reasons why they should. Anticrepuscular rays are spectacular optical phenomena that are quite rare and they require the viewer to have his or her back to the sun or sunset point. Like crepuscular rays, covered here earlier, they are columns of sunlit air streaming through gaps in clouds. Yet while the former seem to converge from the sun, anticrepuscular rays converge toward the antisolar point – the point in the sky directly opposite the sun – creating some stunning effects. Nothing supernatural here or is there? Radiating from this ship in Ye Liou, Taiwan? Anticrepuscular rays actually do not radiate from one point but are parallel shafts of light. They produce an optical illusion explained by da Vinci’s linear perspective according to which at distance, all things convert to a central point. 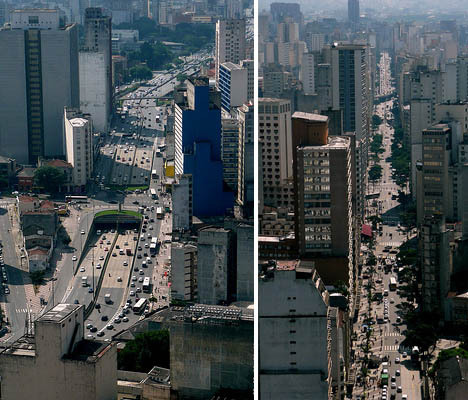 It’s similar to a long, straight road converging toward the horizon regardless of which way one is looking. The illusion is even more spectacular when the anticrepuscular rays seem to converge from an object like the ship above or this rock at Horseshoe Canyon in Utah, below. The hours around dusk and dawn are called the crepuscular hours (literally: relating to twilight) and have given this light phenomenon its name. Dusk and dawn are the times of the rays’ most frequent occurrences because then, the contrast between light and dark is the most obvious. If crepuscular rays are called God’s Fingers, would anticrepuscular rays be the opposite, the Devil’s Feelers maybe? The image below seems to show anticrepuscular rays converging from a gorgeous glory, captured above the clouds on a flight to southwestern Tennessee. Below the clouds, the phenomenon would have been observed as crepuscular rays. Setting sun + well placed clouds + a bit of luck = anticrepuscular rays. So next time you watch a spectacular sunset, make sure to turn around as something unusual if not even more spectacular may be awaiting you. The Hurt Locker" director Kathryn Bigelow has won the Oscar for best director, become the first woman ever to achieve the top honor.Above, Bigelow arrives at the 82nd annual Academy Awards Nominee Luncheon at the Beverly Hilton Hotel in Beverly Hills, California on February 15, 2010. 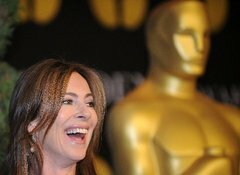 "The Hurt Locker" director Kathryn Bigelow has won the Oscar for best director, becoming the first woman ever to achieve the top honor at the Academy Awards. While her best best-known films were such fare as the vampire pic "Near Dark" and the Patrick Swayze surfing drama "Point Break," the critically-acclaimed "The Hurt Locker" has put Bigelow into a different stratosphere. She was the first woman to win the Directors Guild of America award for outstanding directorial achievement in a motion picture for "The Hurt Locker." She also won the best director prize at the 2010 British Academy Film Awards. She was nominated for a Golden Globe but ex-husband James Cameron took the prize for his 3D sci-fi epic "Avatar." Bigelow was the first female to win a BAFTA Award for best direction and fourth ever to be nominated for an Oscar after Lina Wertmüller for "Seven Beauties" in 1976, Jane Campion for "The Piano" in 1993 and Sofia Coppola for "Lost in Translation" in 2003. "The Hurt Locker" follows a United States Army Explosive Ordnance Disposal (EOD) team during the Iraq War and stars Anthony Mackie, Brian Geraghty and best actor nominee Jeremy Renner. They star as members of a U.S. Army EOD unit in Iraq and the film tells of their tour together as they contend with defusing bombs and the threat of insurgency. Well it seems that losing weight in an effort to improve his defensive slippage this season wasn’t good enough for Ron Artest. He needed a bit of extra motivation. 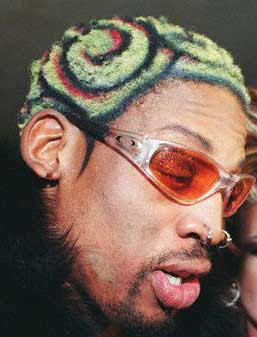 So Ron being Ron, he figured ‘hey, why not dye my hair blonde and shave/color in the word ‘defense’ into my scalp in Japanese, Hebrew, and Hindi?’. That’s gotta help his defense right? Don’t forget to check out The Hoop Doctors new weekly video podcast series with Kevin Burke. Episode 002 published today covers your week that was in the NBA, discussion about Kobe’s obsession with MJ, Rodney Stuckey’s collapse, Dahntay Jones defense on ‘Melo, and much more. Wipe away the tears of "Avatar" not winning an Oscar and get ready for a jolt: The new "Iron Man 2" trailer just came online. More is the operative word here. More of the grand prix scene, more of Whiplash, more of Sam Rockwell, more of War Machine. Key line: "I want to make Iron Man look like an antique." Ben Stiller usually does something zany at the Oscars every year, but this year is probably his craziest stunt yet. Stiller presented the Achievement in Makeup award as a Na’vi from James Cameron’s Avatar. He heckled James Cameron a bit (which Borat wasn’t allowed to be involved in because of Jimmy’s thin blue skin) and made a funny Spock quip. Definitely one of the highlights of the night. infosthetics.com — Sam Loman [just-sam.com] created an original take on illustrating the inner structure and workings of the human body as the tight intertwining of different systems (e.g. arterial, digestive, musculetal, respiratory, etc. ), by way of a subway map metaphor. i.imgur.com — Nick Nichols, the “Indiana Jones of Photography," produced the first-ever high-definition, seamless composite photo of an entire redwood. It’s 300 feet tall and between 1,500 and 2,000 years old. The photo was created with 84 very high-resolution images, taken at approximately 3-foot intervals from a vertical dolly rigged parallel to the tree. Official HD Promo Video for Gorillaz' fantastic new single 'Stylo', taken from the new album 'Plastic Beach'. 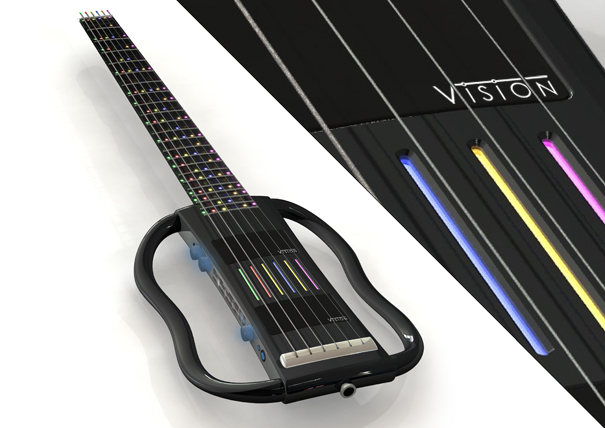 Vision is a self-teaching electric guitar. 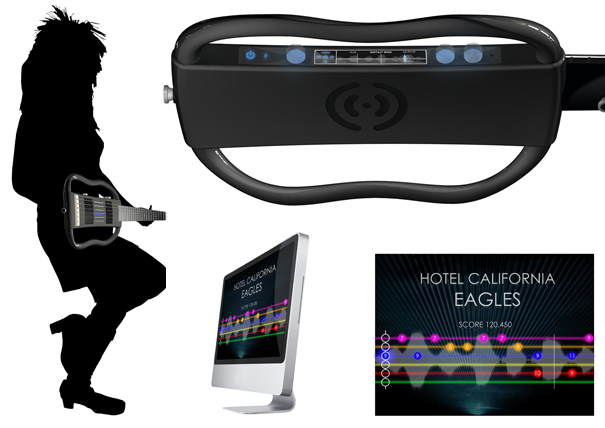 It’s an LED-lit neck and body working in unison with guitar learning software. Tune is always tune, reducing the time a student uses on this elementary task. Vision teaches through games involving visual and audio feedback. Chords, percussion, and popular music are played alongside the student to provide easy assistance, allowing the student to become familiar with the instrument in an environment they’re basically already used to. Connect to a computer with Bluetooth, plug in an amp, or go unplugged with battery. Gameplay is very similar to popular guitar games out now where students complete levels, difficulties, and unlock challenges. Connecting to an amp allows the student to play uninhibited. The guitar has regular tone and volume knobs as well as a built-in effects system. 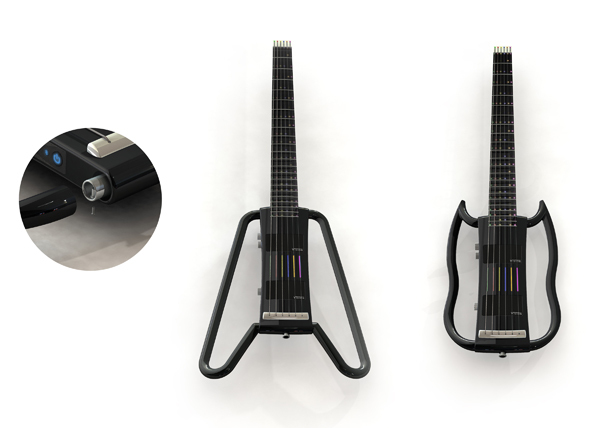 Unplugged works on rechargeable batteries, LED lit fretboard and rear-mounted speaker allow the student to practice or play portably. 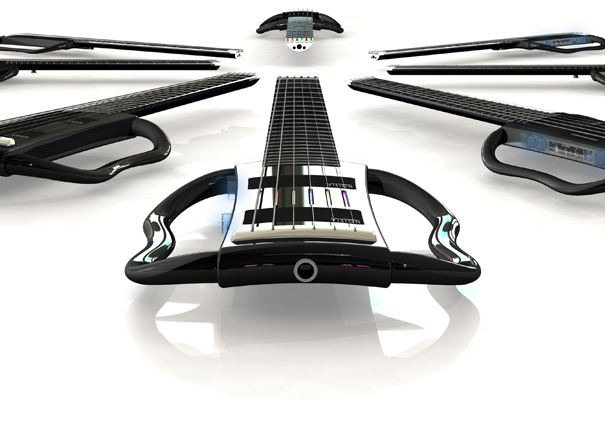 The guitar comes standard with several interchangeable bodies to appease any weirdly shaped person. New York City chef and new dad, Daniel Angerer has added cheese made from his wife’s breast milk to the menu at his Klee Brasserie restaurant. While eccentric foodies and their culinary masters sometimes travel great lengths to procure hard-to-find ingredients that satiate exotic palates and put them on the cutting edge of innovation, Angerer found his “gold” ingredient right at home… sleeping next to him. But his idea to make cheese from breast milk could possibly be one of the year’s biggest D.I. Why? moments. This is possibly where locavore enthusiasm, a preference for humane dairy products, and the blurry mind state that too many sleepless nights as a new parent intersect — but who am I to judge? The chef calls his creation Mommy’s Milk Cheese and has been offering patrons of Klee Brasserie sparing samples (only two quarts of milk were used to produce a small amount of cheese). Ah yes, the good ol' pull-the-tablecloth-off-the-table-without-sending-dishes-flying routine. The oldest trick in the book? Possibly, but BMW has taken it upon themselves to update the classic demonstration in a major way. How 'bout upping the ante with 24 complete place settings around a giant rectangular table? Yeah, that'd do it. 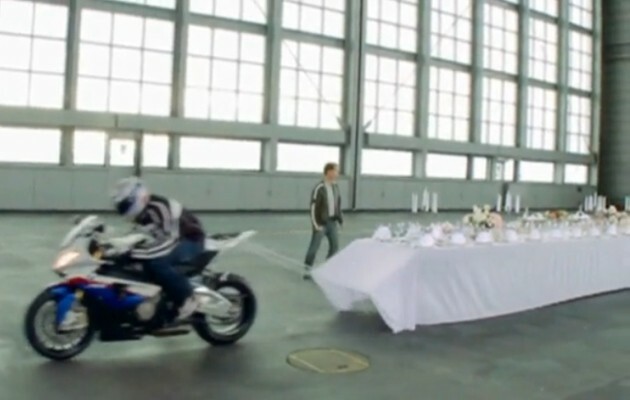 Just how is BMW planning to remove said tablecloth? Using a new S 1000 RR superbike, that's how. Will it work? Well, it's really a question of physics, right? Take 193 horsepower and a 0 to 60 time that's just shy of 2.9 seconds. Add in one rider with a quick set of wrists and shake well. Garnish with celebratory wheelie. We highly recommend that you click past the break to see it all go down on video. It's very much worth your time. DIY Hoverwing. Image via The Nelson Mail. The Cold War-era Soviet ekranoplan--Russian for "sea skimmer"--was one of the most ridiculously awesome high-speed cargo-movers ever devised. 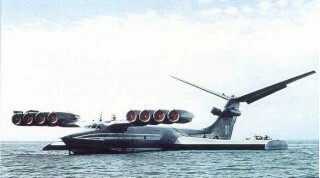 Capable of carring 544 metric tons (that's 2.4 million pounds, or 1,200 tons) in its most extreme form, the ekranoplan is basically a ground-effect aircraft crossed with a ship. And now you can build your own Subaru-powered version in your back yard. Well, sort of. 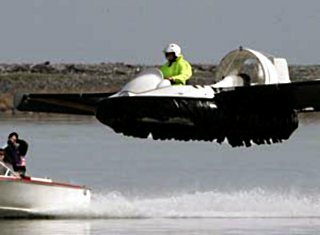 A New Zealand man built a Subaru boxer engine-powered vehicle he calls the Hoverwing, which is a cross between a conventional hovercraft and a ground-effect airplane, capable of 61 mph at 4-5 feet above the water's surface. The concept isn't actually new--even of the Subaru-powered, DIY type--but new or not, it's still unreasonably dangerous, looks unspeakably fun and it's something you can build yourself if you're sufficiently motivated and capable. That's the sort of thing that deserves another look. Check out Universal Hovercraft's site for a good start on building your own. Deciding on a top ten list of anything is usually pretty difficult. Unless you're talking about, say, the top ten numbers one through ten... narrowing down and choosing only ten of whatever often takes a great deal of effort. When it comes to the world of beer, with the vast array of choices out there, things become extremely problematic. 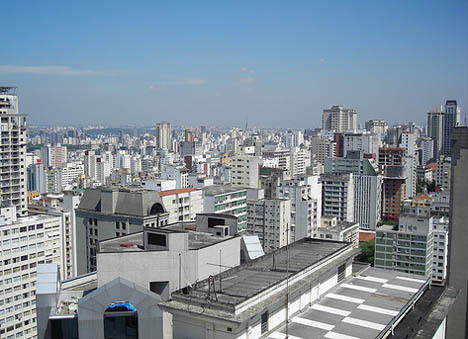 Luckily, choosing ten of the best cities in which to drink a beer isn't quite so difficult. While there are no definitive answers to the best places in the world to sip a brew -- and beer culture in certain areas changes from year to year -- there are certain cities that deserve special attention. In no particular order, here are 24 outstanding beer cities you should definitely try to visit with your mate -- or your bar mate. Portland is a beer lover's paradise. Often referred to as "Beervana" or "Beertown," the city boasts a collection of production breweries and brewpubs totaling a whopping 31 -- more breweries per capita than any other city in the world. Well-known craft breweries Widmer Brothers and Pyramid call Portland home, as does near-cult status brewery Hair of the Dog, and popular craft breweries Rogue Ales and Deschutes Brewery operate brewpubs practically around the corner from one another. In addition to such a proliferation of great brewing operations, Portland is fairly well-regarded for its beer culture and gastronomy, making the city's title of "Beervana" difficult to refute. If Portland is leading America in the fine art of beer gastronomy, Brussels is certainly leading the way in Europe. While its sister to the south, France, is content with basking in the fame of the grape, Belgium has taken on the glory of the grain. The country is world-renowned for its unique beer specialties, many of which use spontaneous fermentation by wild yeasts and bacteria, and there's no better place to enjoy Belgium's famed beers and Cuisine à la Bière than its capital city, Brussels. However, if you're looking for a "beer vacation," be sure to check out this essential guide to Belgian breweries by region. It's no surprise, then, that San Francisco is thought of by many as the birthplace of the "craft beer revolution" in America, with Maytag the founding father. Maytag and his brewery are still churning out popular beers today, alongside many of the other breweries and brewpubs that have sprouted up, such as the popular 21st Amendment Brewery. No guide to good beer locale can truly be complete without the inclusion of Germany's historic city Bamberg. The city, located in the Franconia region of Bavaria, survived Allied bombings in the Second World War, and its Altstadt is classified as a UNESCO World Heritage Site. In Köln, Germany, Kobes (waiters) in the city's Brauereien, keep the 200ml glasses (Stangen) coming until you signal you're finished by placing a coaster over your drinking vessel. But the city's biggest attraction for beer lovers: it's traditional specialty Rauchbier, or smoke beer, which uses malt dried over beechwood fires. The beer takes on a deep smoky flavor that pairs perfectly with smoked dishes, and nowhere can this specialty be enjoyed fresher or in greater quantity than in its historic hometown. Brewed and imbibed the world over, the prototypical Irish stout was first brewed up in the brewery of Arthur Guinness at St. James's Gate, Dublin. The brewery celebrated its 250th anniversary in 2009, having been founded in 1759 when Arthur signed a 9,000-year lease for the spot at St. James's Gate. While every batch of Guinness stout brewed around the world uses a little of the original, visitors to Dublin know that it's best consumed at the source, served up from a cask at one of the city's classic pubs. Cologne is another one of Germany's cities with its own special beer tradition: Here it's Kölsch, a pale, subtle top-fermented ale that drinks as easily as a light lager. Perhaps it's because it goes down so well that the Kobes, waiters in the city's various Brauereien, keep the small 200ml glasses (called Stangen) coming until you signal you are finished by placing a coaster over your drinking vessel. Though the American South lagged for quite some time behind the rest of the country in embracing craft beer, it's catching up quickly. Next to Asheville, perhaps the greatest city in the South in which to enjoy beer is Georgia's capital, Atlanta. Two award-winning production breweries operate in the city, Atlanta Brewing Company and Sweetwater, and brewpubs and great beer bars are scattered throughout. But for a real treat? Head to Decatur, where you'll find one of the nation's premier beer bars, the Brick Store Pub. Here you'll find constantly-rotating taps, a second bar dedicated to Belgian beer, an extensive bottle list, and a wonderfully eclectic, beery atmosphere. Not to mention Munichin a list of great cities in which to drink beer would be like leaving hops out of the libation -- sure, it can be done, but it just wouldn't seem right. Though the traditional beer culture in many of Germany's cities seems to be slowly withering away, the famous beer halls of Munich's Altstadt, especially the (in)famous Hofbräuhaus, provide a jovial atmosphere full of kitschy charm stoked by huge liter mugs of beer freshly brewed on-premises. Then there is what is undoubtedly the most famous marriage-ceremony-turned-beer-festival in the world, the annual Oktoberfest celebration. Sure, there may be some cities in the world better-suited than Munich in which to enjoy beer, but there are none more well-equipped for drinking it. -- The above was written by Lonnie C. Best, Seed contributor. Alcohol isn't the drug most associated with Amsterdam, but maybe it should be. Because of its central location, the Netherlands capital is practically overflowing with English and Belgian beers. It's also got cobblestone streets, scenic waterway views and beer bikes. Wait, beer bikes? Yep, in Amsterdam you can rent a bicycle that fits 10 to 20 people – and a full bar. 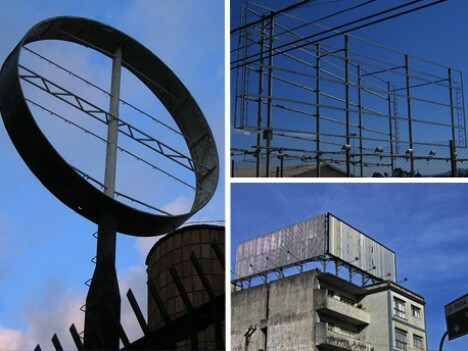 So you can do your sightseeing and beer-guzzling at the same time. Underdog Asheville beat out brew king Portland in a battle for "Beer City USA" in 2009 and some Pacific Northwesterners will never forgive them. But they should. Along with a big city-worthy music scene, a drop-dead-gorgeous mountain backdrop and good old southern hospitality, Asheville has one brewery for every 10,000 of its citizens, including the rocking Highland Brewing Company. That puts it right at Portland's heels with the second most breweries per capita in the U.S. Bonus: Asheville also holds three annual beer fests – Brewgrass, Oktoberfest and Winter Warmer -- throughout the year. After the Revolution, Boston saw a surge of Irish immigrants – and Irish pubs, many of which are still pouring Guinness. But Beantown's culture of revolution isn't stuck in the past. Boston kicked off the microbrewery trend with one of the country's first craft brews, Samuel Adams. As arguably the most European city in North America, Montreal boasts brew houses that resemble British pubs and French taverns and beers that rival the best Irish stouts and Belgian wheats. At Le Cheval Blanc, the city's oldest brewpub, try a Canadian specialty like a maple or cranberry ale. Also like Europe, Montreal patrons like to stay out late – most bars don't open until late afternoon and stay open well into the wee hours of the morning. A sunny, semi-tropical paradise where serious craft brewers mingle with Corona-swigging surfers, San Diego was named the country's top beer city by Men's Journal. There are a mind-boggling 24 breweries mentioned on the San Diego Brewers Guild's Web site. One such brewer, Green Flash, is named for the phenomena purported to appear over the horizon at sunset as you sit sipping a cold one and noshing on fish tacos. The Rockies don't just taste like Coors anymore, thanks to a certain broken bicycle. Before it swept the nation, New Belgium Brewery's toasty amber Fat Tire was dreamed up in a Fort Collins basement. Host of the Colorado Brewer's Festival, where else can you swig brews from up-and-comers like Big Horn Brewing Company (home of the Buttface Amber Ale), tour the first wind-powered brewery and also visit the home of the country's most famous beer maker, Anheuser Busch Brewery, all while surrounded by Old West storefronts and purple mountain's majesty? It can get cold in Wisconsin. Real cold. Fortunately, Cheeseheads have a history of warming their spirits with beer, wine and spirits. Like many U.S. cities, Madison has seen a rush of microbreweries in recent years, like Ale Asylum and The Great Dane Brewing Company. But lest you think the progressive college town's suds scene is getting snooty, remember you're in a state where sports bars still outnumber gastropubs by a long shot. Wisconsinites drink beer because it's their state mascot, because of their region's deep German roots and because, well, they really like beer. -- The above was written by Cheri March, Seed contributor. Portland is home to six microbreweries, including the award-winning Shipyard Brewery. Gritty McDuff's in-house restaurant features outside seating which is dog-friendly. The state as a whole is home to a tremendous number of craft breweries, creating a beer culture that runs through the taps of the finest restaurants and the coolers of the simplest convenience stores. Be sure to pick up a six-pack to enjoy on the Casco Bay Lines sunset cruise, which allows discreet imbibing. In New Orleans, it's not unusual to find great beer deals, such as "buy one get three free"; you can save enough on beer to cover your flight and hotel. Nawlins is the undisputed home of amazing food, great music and parties that never end. The Quarter is the center of all of this. To-go cups are common, making it easy to continue the party as the mood motivates movement. It is not unusual to find great beer deals, such as "buy one get three free"; you can save enough on beer to cover flight and your hotel in a heartbeat. And let's be honest, even if The Big Easy weren't that awesome, the city would still make this list, thanks exclusively to the incredible Abita Brewery. Key West has "end of the world syndrome." As the Southernmost point of the North American continent -- and home to the country's southernmost brewery -- Key West boasts an eclectic group of locals and visitors, which translates to a (nearly) judgment-free zone. It is also another one of the few places where beer is offered in to-go cups, allowing you to wander the streets and sample the music in any of the open-air venues before committing to going in to any one of them. Seattle is also known for having a bit of the "end of the world" syndrome. While the climate is not as bad as it is reputed to be, it is not quite as welcoming as that of Key West. Regardless, the weather is more than compensated for by the music and microbrew culture. Seattle itself is home to a slew of brew pubs and six breweries, including the now bi-coastal Red Hook Brewery. There is much to be said for the atmosphere of a college town. It doesn't fit the pattern of "end of the world" syndrome, but it still has an atmosphere of acceptance. Even better, Burlington is strongly influenced by the presence of Magic Hat Brewery (located in nearby South Burlington) and is host to the annual Vermont Brewers Festival. Located on the banks of Lake Champlain and surrounded by Vermont's trademark mountains, Burlington is a perfect beer-love nest. NoHo, as locals call it, is far from your average college town. Local schools range from the University of Massachusetts to two of the Seven Sisters. You will be hard-pressed to find an establishment that doesn't have at least one beer you've never tried, with plenty of street performers to entertain you from site to site. A short drive will take you from the city's center to the Northampton Brewery and restaurant to cap off your visit. Every city on this list celebrates its beers. To that end, Baltimore hosts Baltimore Beer Week, which, appropriately, is a ten day celebration. The city proper boasts several breweries, and the bars in town pride themselves on the variety of craft beers on tap. Just remember that when the bartender calls you "Hon," it's not flirting – it's just the city's trademark hospitality. -- The above was written by Cate Kulak, Seed contributor. If you've been counting, you'll see we've only listed 23 cities. So what happened to City Number 24? Well, we meant to include 24, but when we looked over our research, some of our notes were too hard to read. So we'll just close with this: whatever city you're in, enjoying with friends or family and a cold beer -- that's the 24th city on the list.